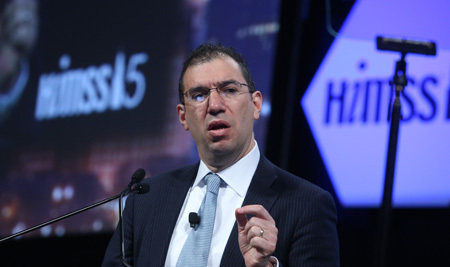 Speaking at HIMSS15 on Thursday, Andy Slavitt, acting administrator for the Centers for Medicare & Medicaid Services, said providers will need to evolve in order to benefit from value-based reimbursement, and "will need technology to help them get there." Slavitt spent more than two decades in the private sector: he had leadership roles at Optum and OptumInsight; he was founder and CEO of HealthAllies; he did stints at McKinsey & Company and Goldman Sachs. But this was first visit to HIMSS since he joined CMS in 2014 as principal deputy administrator, he said. It wasn't long after arriving in Washington that it was driven home to him how the many changes coming to the U.S. healthcare industry – "exchanges, ACOs, delivery system reform, Medicaid expansion" – were all "entering a distinctive operational stage," Slavitt told the keynote audience. "It became clear that what was beginning to matter most was implementation: how to take policy and implement it in a way that will bring maximum value." There was enormous opportunity, he said, "but only one catch: Washington." Slavitt's career "has been spent figuring out how to do things in the private sector: Wall Street, VC firms, startups, corporate boardrooms. But I knew enough to know that Washington is a special kind of place. I got plenty of warnings." Nonetheless, he said, "a few months in, and I can report that I love this job: I've never faced a larger and more interesting agenda." As he rolls up his sleeves to help lead this wholesale change to our sprawling healthcare industry, he keeps two questions, in mind. First: "Who is our customer?" Some 140 million beneficiaries and consumers rely on CMS every day, said Slavitt. "We need to understand who these people are. It's the Medicare patient who seeks care in a community hospital; it's they young Marketplace customer, looking for options; it's the woman who's just made the difficult decision to put her mother in a nursing home and wants to find the best quality; it's the cancer patient who's decided he wants to be taken care of at home; it's the family with a severely disabled child on Medicaid that requires 24 hour care, and are watching every dollar." The second question: "Who is our boss?" The answer to that is simple: "our shareholders: the taxpayers," said Slavitt. "The average American family invests thousands of dollars a year in CMS programs; they expect us to get value for what we spend," he said. They expect the agency to "make sure that the Marketplace, Medicare and Medicaid thrive – not only today but in the future when they need the programs." Slavitt pointed to some early successes in the first five years since the Affordable Care Act. The number of uninsured Americans is down from more than 20 percent to less than 13 percent. We've reduced patient harm in hospitals by 17 percent. Healthcare inflation is at its lowest rate in years, and now growing slower than per capita GDP. "Using the tools of the ACA we're making real gains," he said. But there's still much more to do. "More providers and more communities will need to be able to transform the care they provide so they will benefit from value-based reimbursement," said Slavitt. "And they will need technology to help them get there." Over the next few years, "technology will need to be able to accomplish three key things," he said. First, "care providers and patients should begin to feel the benefit of all this investment in technology." He called it a "care dividend." Taxpayers have poured billions into technology adoption, and now "what matters is whether it will give providers more time and better ability to give care to their patients." Second, "we have a great need for a more modern infrastructure for healthcare," said Slavitt. "We need a Moore's Law effect in healthcare productivity if we're going to care for our dual eligible patients and our aging baby boomers. We need the healthcare system to adapt and to learn and we need technology to do that." Toward that end, "I think we could do with a little less innovation on shareable and wearable, and instead a little more focus on the enormous opportunity there is to modernize the healthcare infrastructure," he added. "Aging technology is weighing us down. The third area is one "where I have greatest concerns," said Slavitt. "Interoperability." By example, he spoke of one hospital he'd visited recently that had a top-notch electronic health record and terrific analytics capabilities. But "their physicians can't follow patients who leave their care to see specialists or go to (another) hospital," he said. "To be clear: This won't be acceptable to patients," said Slavitt. "It will not be acceptable to care providers, it's not acceptable to taxpayers and it's not acceptable to us."